Jaspa’s Waterloo is an educational children’s book by author Rich Meyrick, and the third book in the Jaspa’s Journey series. Aimed primarily at nine to eleven-year-olds, title character Jaspa and his animal friends are what’s known as Ses, miniature versions of animals that could sit in the palm of a child’s hand. Having tackled the Great Migration and the City of London, Jaspa finds himself on the battlefield most famous for the Battle of Waterloo. 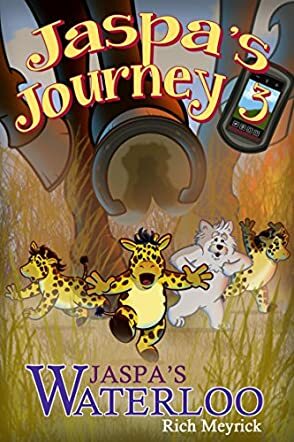 Ben is the full-size hero, bullied into a trick that sends him searching for a GPS Geocache hidden somewhere on the battlefield, and Jaspa and the rest of the Ses are determined to help him find it. But there are more enemies on the battlefield than they think. I really appreciate the clear research endeavors which have gone into Meyrick’s work, providing a rich and accurate historical backdrop for Jaspa’s latest adventure. The concept of the miniature animals is admittedly bizarre, but well-conceived enough to engage readers once they’re introduced to the Ses, and certainly suitable for the targeted age range of readers. I do feel that the style wanders sometimes between the 9-11 age range and an older field, almost middle grade fiction, but Meyrick’s plot lines are consistent and never rushed. Jaspa as a leading character is an endearing hero that I would hope to see continuing to develop as the series goes on, and overall Jaspa’s Journey 3: Jaspa’s Waterloo would be a great buy for any parent teaching their child to appreciate world history and culture.